“First it was one dog and a small car. Then two dogs and a bigger car. Then more dogs and another move up in car size. A camper for going to trials and clinics followed.” This is how Tara Dier describes the progression of her sheep dogging hobby. Dier was settled into a career as a lawyer in Toronto when she decided to get her first dog. She had a friend with a Border Collie so she chose that breed due to what she describes with a laugh as “no great amount of imagination”. She went to her friend’s breeder and got a puppy. She called him ‘Doug’. It took ‘Doug’ very little time to show the new dog owner why the breed is not for the faint of heart. Athletic and bred to work, Border Collies learn quickly but are not discerning in the lessons they retain. As Dier describes it the ‘bad stuff’ sinks in as fast as the ‘good stuff’. She was working very hard to give ‘Doug’ enough to do so when an acquaintance said she knew someone who was giving herding lessons, Dier thought it might be the perfect thing for ‘Doug’. So began Tara’s journey into the world of sheep dogs. 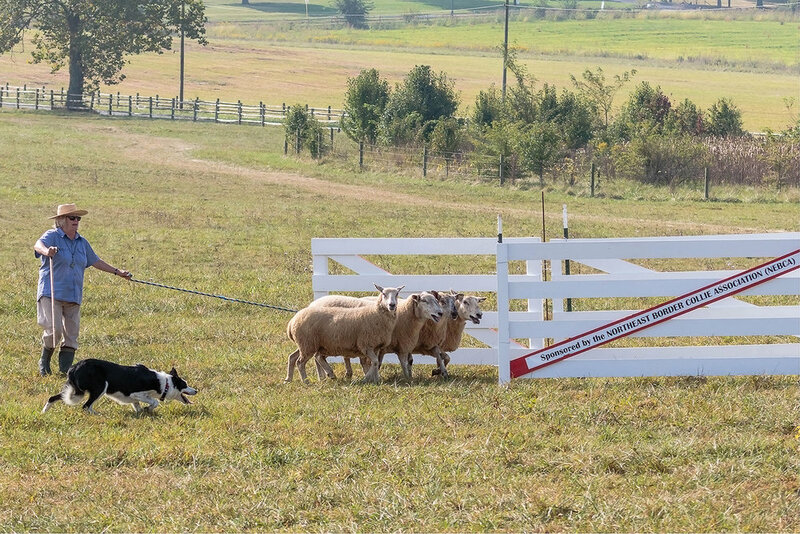 She travelled just north of Toronto for regular lessons with ‘Doug’, but it was when she made a trip to the prestigious Kingston Sheep Dog Trials that the sport really caught her imagination. Held at Grass Creek Park east of Kingston every August, the Kingston Sheep Dog Trials attract competitors from across Canada as well as the U.S.A. and the United Kingdom. Started 30 years ago by Amanda Miliken, the Kingston Trials has grown under her stewardship into the biggest event of its kind in North America, showcasing some of the best teams in the sport, the ‘Big Hats’ as they are known in the sheep dogging world. During three days of competition the event also hosts over 7,000 spectators, some of who return year after year to cheer on their favourite dogs and handlers. The ancestry of the Border Collie is the history of choices made to create the ultimate sheep dog. Trials were developed in the U.K. as a way to test the working ability of the breed over a course devised to showcase skill and instinct. This course has changed little since it was developed in the late 1800’s. The test helped develop and preserve the Border Collie as a working dog, and of course allowed for bragging rights among the shepherds and farmers who depended on the dogs to move livestock. 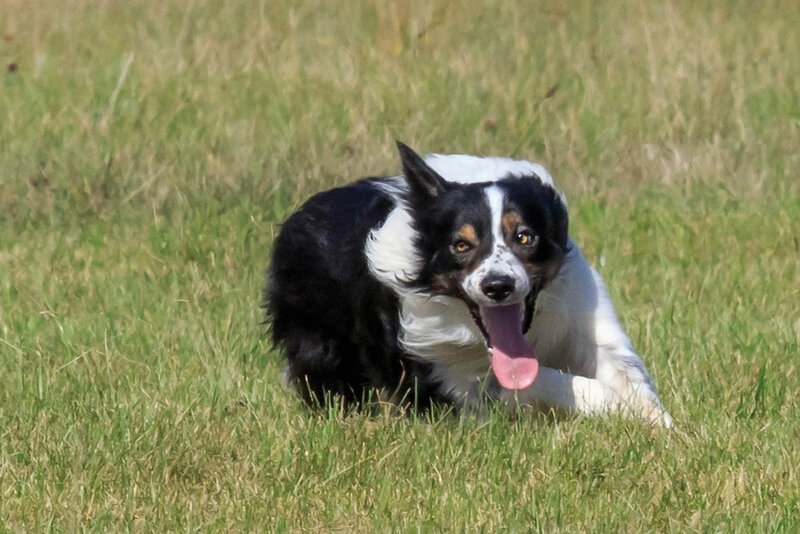 The history and tradition of sheep dog trialing holds great appeal for today’s competitive handlers, who often choose classic names for their dogs as a nod to the breed’s heritage. Names such as ‘Sweep’, ‘Tweed’ ‘Ben’, ‘Bess’, and ‘Moss’ are often found in the pedigree of today’s working Border Collie. Attend any sheep dog trial in Ontario and you are likely to see these traditional names in the running order. Some years after that first visit to the Trials, the then city dweller was nearing retirement. She already had the large car, a couple of Border Collies and a camper. All that was left was the acquisition of a small farm and a flock of sheep. She put her small city home up for sale, headed to the country and started looking. From the sun-filled living room of the retired lawyer’s farmhouse north of Stirling, I can see a small flock of sheep grazing in the far field and the crumbling stone foundation of a barn in the foreground. It’s not hard to imagine why she picked this spot in Hastings County to immerse herself in the lifestyle of a sheep dogger. But there was more to her decision than the beauty of the countryside and the still reasonable price of farmland in the area. Southeastern Ontario is a hot bed of sheep dog activity and Dier’s location is within striking distance of much of it. With trials throughout the summer, the season hits its stride in late August when Miliken hosts her ’80 Acres’ trial just before the Kingston Sheep Dog Trials. These events are followed in October by the ‘Triple Crown’ series of trials, which take place in the Peterborough area and nearby Indian River. I knew Tara from her small car, one Border Collie days in Toronto. I hadn’t seen her in some years when we ran into one another at a local gardening store and discovered we were country neighbours. When I told her I was considering getting a Border Collie, she invited me to work her seasoned trial dog ‘Fleet’ to see if herding was something I might enjoy. In sheep herding, handlers are not always trainers. Handlers take on much of the responsibility of refining their dog’s skills throughout its career but many will send their dogs to someone else for initial training. Even an experienced handler may choose to buy a dog that is already well-trained. Those new to the sport are strongly encouraged to go this route; putting a novice handler on the field with a green dog is often compared to putting a beginner rider atop an untrained horse. It’s generally not a recipe for success. At seven years old Tara’s ‘Fleet’ was retired from trialing because he lacked the confidence to work well in the large, wide open courses at the top level but he still loved to work. An easy going, biddable dog who knew his job, ‘Fleet’ was the perfect guy to get a novice like me started. Out on the field facing a small flock of sheep, ‘Fleet’ waited beside me. If movement could be still at the same time, ‘Fleet’ was what it would look like. “Send him.” Tara said. “Away to me,” I said and he was off before I finished the phrase, arcing out around the sheep a couple of hundred yards away. He reached the top of the flock and tucked in behind them. His head lowered, ‘Fleet’ moved forward and did what a good sheep dog does. He fetched the flock to me. Catching glimpses of him moving steadily behind them I saw ‘Fleet’ adjusting his course to keep the flock in line. I hadn’t said a thing and it seemed everyone knew the steps to this dance but me. I started trotting backwards. On they came. Tara called out “Lie him down” and I remembered her telling me that’s how you stop a dog. “LIE DOWN!” I shrieked at a volume loud enough for ‘Fleet’ to have heard from the next county. He dropped like a stone in the grass. With the pressure off, the sheep immediately slowed down. They passed by me knocking my legs, to settle about 10 feet away, where they calmly commenced grazing. It seemed like everything that had happened was between ‘Fleet’ and the sheep. I had no idea what role I might ever hope to play in this three-species waltz. I was left with a feeling of complete uselessness, and an inexplicable urge to do it again. Like most sheep dog competitors, Tara has several dogs in different stages of their training. ‘Nicky,’ a spritely four-year-old with a cheerful demeanor, spent the winter of 2016 in Alberta being trained by current North American champion Scott Glen. Tara describes ‘Nicky’ as “eager and fun and a little excitable on the field”. Four-year-old Bernie, so named because he is a big tri-colour boy who resembled a Bernese Mountain Dog as a puppy, is learning to channel his exuberance on the field. Tara is having a lot of fun with these two youngsters, but it was competing with her 10-year-old dog ‘Scott’, that gave her the most exhilarating moments of her time in the sport. ‘Scott’ belonged to Tara’s friend Vergil Holland, a renowned trainer, breeder and handler from Kentucky. When Vergil passed away three years ago, ‘Scott’ came to Tara. “‘Scott’ knows how to do everything.” Tara says. “He never rattled the sheep, he was responsive and smooth. He was a treat to handle.” I think running ‘Scott’ was a little like driving a Maserati, there would be nothing quite like it and not something one had a chance to do often. In Hastings County, Dier and her black and white crew are far from Scotland, where it all began, but it matters little to the dogs if they work the hills of the border country or the hills of Hastings County. The journey that began in a small city house with one Border Collie has taken Tara to farm ownership, 29 sheep in her field and three Border Collies (down at the moment from her average of six). Positioned at the hub of the wheel of Ontario’s sheep dogging activity, Tara has attained the lifestyle, she and her dogs are busy, and that suits them all just fine. ‘Scott,’ the Kentucky gentleman with the big paws and a way with sheep, is retired now. He enjoys walks in the fields and lighter work. Three years ago ‘Fleet’ got a job offer. The Tivoli Lake Preserve in Albany, NY received a grant to protect and revitalize the area through an approach that involved ‘targeted grazing’ to reduce invasive species. The program paired a young farming student with a dog and a flock of sheep. With his biddable nature, work ethic and previously demonstrated patience with novices, ‘Fleet’ was a perfect fit. Tara jokes that he is the only one of her dogs that actually got a real job. I did get my Border Collie. I’m a ‘Little Hat’ in the sheep dog world, in fact I’m so green I don’t even think I have a hat size. But my working bred collie ‘Gin’ was born with one. She spent a month in the fall of 2016 back at her breeder’s getting started as a sheep dog. I took her out and experienced the thrill of seeing a working dog do what it was bred to do. ‘Gin’ injured herself in non-sheep related activity, so she’s on house arrest right now. When she is snoozing by the fire her feet twitch and I’m pretty sure she’s rounding up sheep in her dreams. But a sheep dog hobby is a huge commitment; it is not just a sport, it’s a lifestyle, and I’m just not sure I can make that commitment right now. I must admit though, I find myself wondering if the cattle fencing around my fields would work for sheep. And I do think I could use a bigger car.